Having a good time is quite exhausting, as I’m sure you all know. I wanted to follow up and give you all the dish on our contests yesterday here at the Malvern Americas HQ in Westborough, MA. First, let me tell you, the competition was fiercer than I ever could have imagined. I need that disclosure, as I’m sad to say I did not win first place in the chili contest nor the costume contest. Instead of being a sore loser, I can honestly say that everybody who competed in either contest really put their creativity into it and the winners were all extremely deserving. As for the chili contest, we had 6 unique chilis for our judges to eat. The contest rules had made it clear that toppings were allowed, so there was no drama on that front. But don’t worry, there was a bit of a curveball—one of the contestants brought in HOT DOGS and presented the judges with chili dogs!!! He didn’t win (he was actually the winner of last year’s contest), but I will be honest in saying that I felt a bit cheated when I saw him preparing his chili dogs. 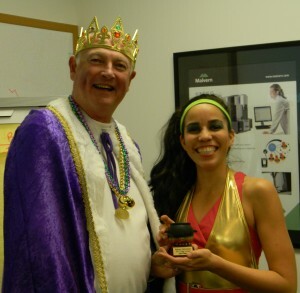 The real winner of the contest was our Applications Lab Chemist, Josie Castillo! She had us all fooled as she kept telling us that she couldn’t even cook an egg a year ago so her chili would probably need work. In fact, she had a very interesting, spicy, smokey chili that everybody loved! I think the curse of winning “Best chili” is that you don’t get any leftovers to take home—people just couldn’t get enough of it. Below you can see the winner, Josie, holding her trophy next to King Bob Feckzo. You may not be able to read it, but the trophy actually says, “1st place Chile”. I am jealous that I did not win an entire Latin country! I would like to give an honorable mention to our runner up’s- Brian Dutko (2nd place: always a bridesmaid, never a bride), and Marisa Fraser-Moreira (3rd place). Brian proved that, even though he may be President of Malvern Americas, he can’t win it all! Marisa produced a delicious turkey chili so there is hope in the world for people like myself who think that turkey chili is NOT inferior to beef chili. Great job done by all! Now, onto the costume contest. Although disappointed that I did not even place in the chili contest, I was determined to be in character and take home the win for best costume. How do you think I did? 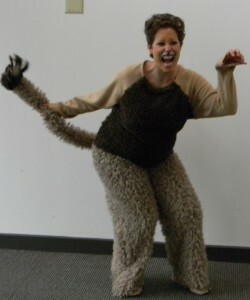 Apparently my roaring needs a little bit of work (and I was BOILING hot in that furry costume)! I did tie for 2nd place with Josie and John, but the real winner of the day was National Sales Manager Dave Peisel. He was bringing us back to the 1950’s with his Greaser costume. We had some visits from furry friends (Dave’s golden retriever and Laura’s cairn terrier- just 8 weeks old!) and we also went to our neighbors, PANalytical, to parade around in our costumes. It was like elementary school all over again. 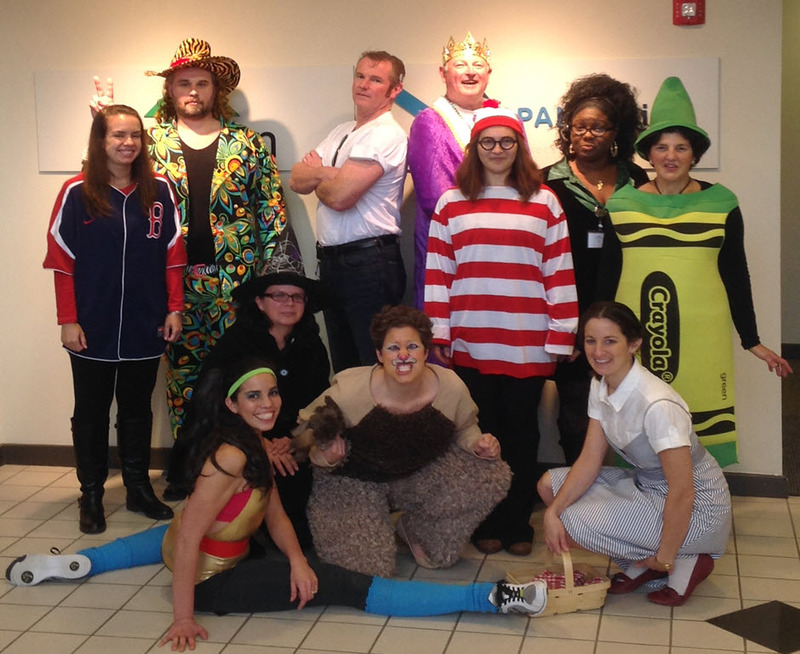 Check out our group picture with all of our costumes and try out the winning chili recipe at home. Let us know what you think, and we are still accepting your submissions of what you can characterize with your Malvern instrument that fits within the Halloween theme. (Back row) Danielle Fogerty, John Rodolewicz, Dave Peisel, Bob Feckzo, Nejea Davis, Kathy Carideo. (Front row) Josie Castillo, Claudia Mujat, Kristen Wilkinson, Sibora Halilaj, Laura Cotton. Crock-pot Chili with a Punch! Cook the bacon in a large pan but do not let it get too crispy then cut it into small pieces and add it to the crock-pot. Saute the celery, onions, and garlic on the leftover bacon fat and add it to the crockpot too. Finely chop the chipotle peppers and grate or finely chop the jalapenos (the amount you add depends on how spicy you want the chili). Add the rest of the ingredients to the crockpot, stir and cook on the low setting for ~6 hours. Don’t forget to do a final testing and adjust the spices if you need to!